Just sign up for my newsletter to receive instant access. Find out exactly which trees I recommend to my clients and why they love them! 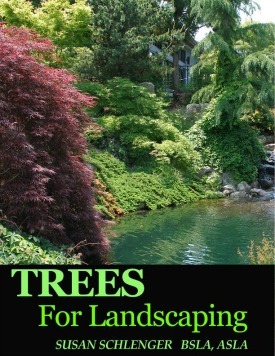 Discover trees I use for my clients! Get help with choosing the right size tree! Find the right trees for your own planting zone! Get tips on where to locate them along with how many to use! Choose for fall color, flower color, growth rates and sun/shade requirements! I am sure you will be happy with both the book and my helpful newsletters. You will receive an email asking you to confirm that you want to receive these emails. Please be sure to confirm so that you can download the ebook! You may unsubscribe at any time by clicking the Unsubscribe button which will be at the bottom of every newsletter. My newsletter every one to two weeks. There are times when you might receive them more often, particularly when I have a special offer for you with a link. In the past, this has typically been in the spring. Professional landscape design information to help you with your projects. Often it is information that I feel is great to know, and sometimes it links back to my site where a related article I wrote might be. I also might link to my services, ebooks, or products that I think you would love and find very helpful. "With the information and tips that Susan will show you there won’t be any confusion or hesitation on choosing your tree, whether it’s for acreage, or a small suburban lot. A wide variety of gorgeous time tested and garden-trialed trees is laid out in detail, along with Susan’s personal recommendations."